Congressional election outcomes are among the most interesting yet difficult to gauge indicators in American politics. The race for control of the House of Representatives is the aggregate outcome of 435 separate races, each with its own dynamics and each with its own unique features, plus the power of incumbency and the fact that though we hate congress, we love our congress(wo)man. "If the election for U.S. House of Representatives were held today, would you vote for the Democratic or Republican candidate in your congressional district?" 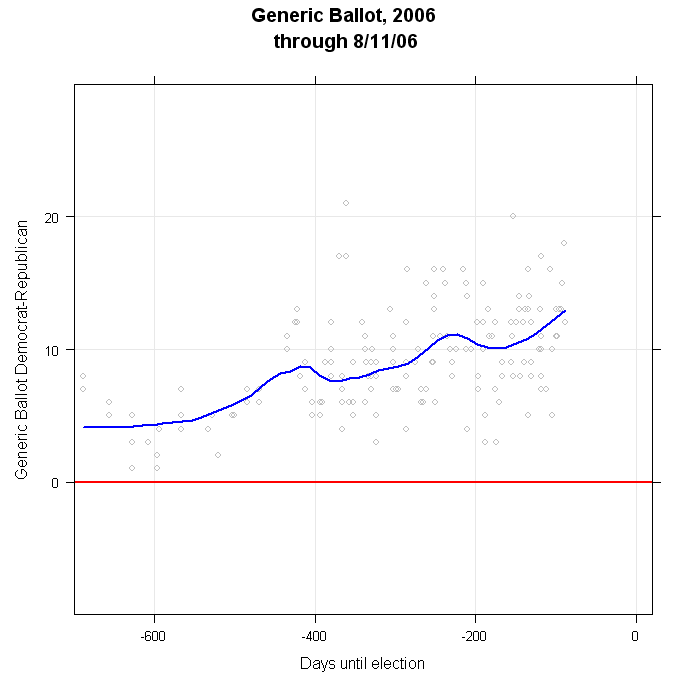 The problems with the question are obvious: no mention of who your candidates are by name (and many voters don't have a clue) or who the incumbent is (a huge advantage in name recognition alone, not to mention positive generalized affect) and the likelihood that uninformed voters reply by reflecting their partisanship rather than anything specific to the race. NONETHELESS, this is the indicator we have, and we follow its ups and downs with great interest. At the moment, this indicator looks quite favorable for the Democrats. Since the 2004 elections, the share of voters preferring the Democrat over the Republican has climbed steadily. There is considerable variation from poll to poll, but the current estimated trend is a Democrat lead of +14.65%. 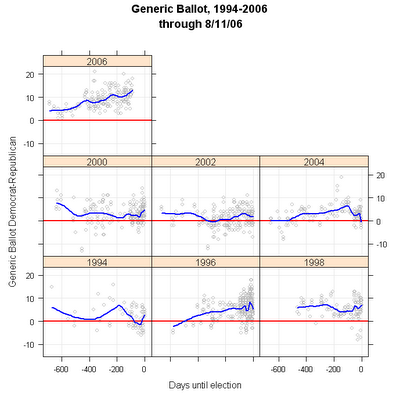 In no cycle since 1994 has the Democratic lead approached 10%, let alone exceeded it. 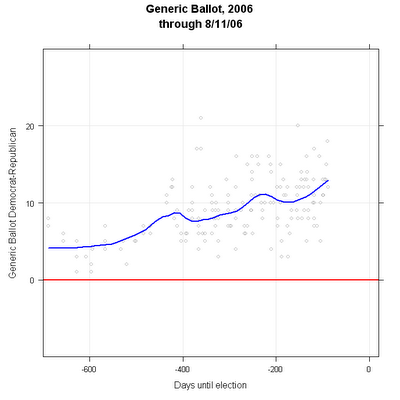 So by the standard of "relative lead" in the generic ballot, 2006 reflects extremely strong pro-Democratic forces.